What does it take to make Dr Pillai (Baba) happy? As an enlightened Siddha master, Baba is complete within Himself and has everything He needs. However, we have observed Baba to be at His happiest when His students show their love not only towards Him, but towards their fellow human beings, especially towards the divine souls who are undertaking this journey with us on the earth plane under less-fortunate circumstances i.e. the poor and the have-nots. Guided by the ideals of love, compassion and humanity, Baba’s US-based charity, Tripura Foundation (http://www.tripurafoundation.org/) has for over a decade, been quietly working to empower the less-fortunate children around the world with Baba’s transformational educational tools and help these children break out of the karmas and destinies that they were born into (i.e. to remain as forest and slum-dwellers and work as labourers, toilet cleaners, coolies and construction workers for their entire life and thereafter pass on this karma to their own children). Now, thanks to Baba’s tools and love, these children have a fair shot at a better life. 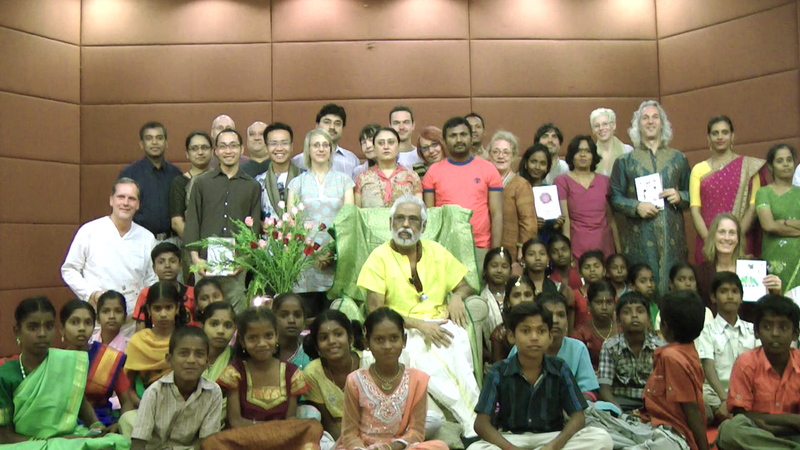 In fact, many of the graduates from Baba’s charity projects such Boystown and Girlstown (children who arrived at Boystown and Girlstown years ago as disheveled slum and forest dwellers) have completely transformed their lives (with the help of Baba’s magical Personal Transformation Program and Phoenemic Intelligence techniques). Instead of becoming cooks, construction workers or day-labourers as they were destined to be, these children have grown up and have gone on to become engineers, teachers and other respectable professions which they would have never dreamed possible! Recently, we had the privilege to return to several of Baba’s HoPE Learning Centers in India to see how the children were coming on. At these HoPE Learning Centers, Baba ensures these children receive basic education, nutritious meals and self-empowerment skills (such as Phoenemic Intelligence to enhance their intelligence). HoPE stands for Heaven on Planet Earth and the changes we saw in these children were nothing short of miraculous! These were children who had been picked from the nearby slums and forests and whose backgrounds were usually the same: they were raised by single mothers (having been abandoned by their fathers years ago) and their mothers would be working menial jobs such as cooks and cleaners, earning a wage of US$20 a month to support the family. When we had first met these children slightly under a year ago, these children were shy, disheveled and looked very much like what you would expect from children living in forests and slums and eating rats and snakes (You can get a glimpse of their living conditions in the HoPE Center YouTube video below). Now, one year later, these children’s transformation have been truly dramatic thanks to Baba’s intelligence-enhancing tools (which also imbibes the children with courage, confidence and self-esteem), basic education, simple meals, and lotsa love from all the people who do divine work at Tripura Foundation including Mohini, Yadeesh, Lalita, Uma and all the local champions who manage the HoPE Centers across South India. Most touchingly, you can see how much brightness and hope there is in these children’s eyes, where once there was none. Here are some beautiful photos of our visit to several of Baba’s HoPE Learning Centers in India. You can click on a photo to enlarge it and watch a slideshow of all photos below. Please watch this touching video from Tripura Foundation which highlights why Baba strongly supports education as the key to giving these children a whole new destiny. I would also like to share with you a personal letter of appeal from Mohini to all of you. Mohini shares how you can help Baba by helping in His mission to give the less fortunate children a better life. Dr. Pillai has said there is a guaranteed way to increase good fortune in your life and that is through acts of kindness and generosity. There is a particularly powerful day when your good deeds are amplified countless times. That day is the first Full Moon after the Summer Solstice, which falls on July 3rd this year. The Full Moon energy on this day has been known throughout the ages to magnify grace, good fortune and good luck. It is the primary day to express your gratitude by giving back to the Teachers, Guides & Mentors in your life. I am writing to you personally about our beloved teacher, who has transformed and touched the lives of so many people. He is particularly moved to help children who are in poverty, as they are so vulnerable. If you wish to support Dr. Pillai and show your gratitude, the best way is to help a child get out of devastating poverty. This act of love will touch his heart, more deeply than anything else. You can make a difference in a child’s life. Join Dr. Pillai in his compassionate mission to save children from poverty and despair. Your loving and generous contribution that you give today will be presented to Dr. Pillai on July 3rd. Every day, the greatest joy in my life is hearing more stories about the phenomena that we’ve created in India through our HoPE Centers – 8 Centers functioning since July of 2011 and we are opening new centers almost every day this month. The success of HoPE Centers is the result of many years of service and accumulated knowledge in various areas of transformational education, feeding and relief programs, Girlstown, Boystown and strategic community building. The entire community around our HoPE Centers, as well as the surrounding villages in these remote rural areas, are astonished at the miraculous transformation in the lives of these children, many of them ‘untouchables’ who were destined for dreary lives of utter poverty, abuse and despair – most of the children being deserted by the father, supported by an illiterate laborer mother or grandmother just struggling to survive, living in mud, straw and garbage shacks in the midst of squalor. We need to know you’re with us as we ambitiously open more and more Centers all through India to reach our goal of 75-100 Centers by December 2012. Would you consider supporting us each month with $10 to sponsor a child, $30 to sponsor 3 children, or even $300 to sponsor an entire center? And would you ask people you know to help as well- by giving even just $10 a month to sponsor a child? We have an answer to the immense problem of global poverty, and we want to demonstrate a proven and effective model in India so that we can soon expand it to uplift all our children.Transformational education that empowers the mind, heart and body of the child, and gives the child the courage and strength to create a new destiny is critical. We’re opening 27 new Centers this month in India, for a grand total of 35 Centers! We need your help in paying our bills by the end of June, and we need your ongoing support to sustain each center. The cost of operating 35 Centers to uplift 1225 children, their families and entire communities is $15,000 per month. About 13 years ago, I was experiencing a lack of joy in my life- Dr. Pillai told me that the greatest source of joy is to give every day to someone who has nothing. I had the blessing to start our charity work in India at that time, and I discovered for myself this truth – the joy of serving the poor is profound and eternal. And the need is urgent – these children aren’t going to make it without our help. Help us create Heaven on Planet Earth by giving HoPE to the forgotten children of rural India- one child at a time can become a leader for the Golden Age. And when we expand throughout India and demonstrate our model nationally, we will do our best to bring HoPE education to all the needy children of this world as quickly as possible. It doesn’t take much to make a difference – you can help a child’s life for as little as S$10 a month!